Well, it's actually a chest of drawers rather than a bedside table, but it's beside my bed and has a space to place my book or pile of books amongst other things. And, it's the first time in 20 years that I've had an actual-off-the-ground-space to put anything and it feels like the height of luxury! Needless to say, I have more than one book on my bedside table. There's the one I'm currently reading, plus there's my Kindle - for when I wake in the night and want to read but don't want to switch the light on - and quite a few others on the 'books I REALLY want to read' pile! 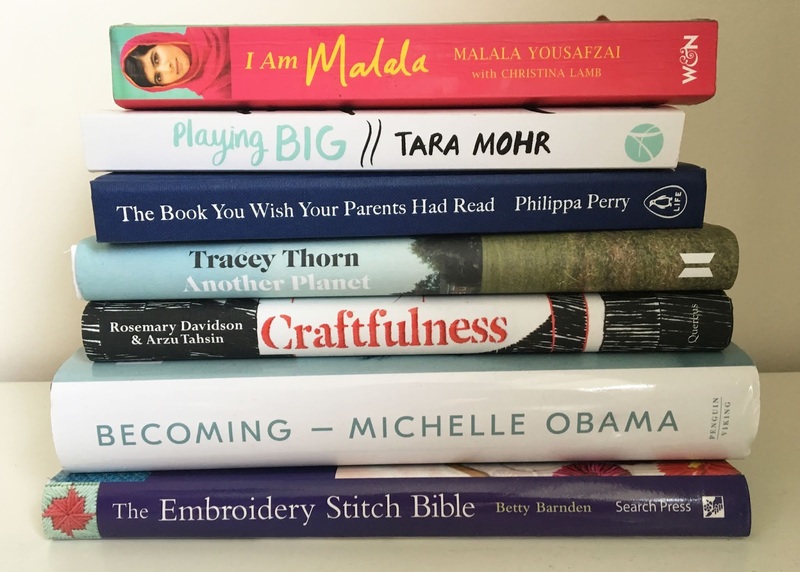 As it turns out, I lied... Whilst I'm currently 'properly' reading 'Becoming' by Michelle Obama, I've actually started reading FIVE out of those seven books!! Ha! The problem is that I mostly read before going to sleep and often then I can only a couple of paragraphs before I drop off! Sometimes nothing more than a few lines. I really should treat myself to an earlier night and get some reading done! I am Malala by Malala Yousafzai: I was given this for Christmas by my husband (along with Becoming) and it's already been well-read in our house! I took it away on our New Year holiday and it was read by my husband, my niece and my almost-teen daughter! My turn now! Playing Big by Tara Mohr: a good friend suggested I have a look at Tara Mohr's website. On opening her web page the first thing I read was "Playing Big is being more loyal to your dreams than to your fears." Well, thank you for that recommendation, V. My dreams are currently thwarted by my fears, so I really need to read this one! Another Planet by Tracey Thorn: Yes, she of Everything But The Girl fame. I recently heard her speak at an event held by Toppings here in Bath. I couldn't see her very well as, unfortunately, the tallest man in the world was sitting in front of me! But I loved the sound of her voice and the extracts she read of growing up in suburbia in the 70's were just so funny. Craftfulness by Rosemary Davidson and Arzu Tahsin: I've long known of the benefits of crafting on my mental health and well-being. None of my friends are ever surprised to hear that I started sewing something at 10pm just because otherwise I might have gone mad! Sometimes it's the only thing to calm me, to take me away from the mundanities of emptying the dishwasher, cooking another meal, tidying the lounge - again! I'm thrilled that it's not just me! Thank you to K for the birthday book voucher that I finally redeemed for this one. Becoming by Michelle Obama: I've only just started reading this but I love the way she writes; so eloquent and descriptive, you really feel as if she is telling her tale to you alone. It's a big ole book though, which absolutely makes this a book to read in the morning - otherwise I might knock myself out with it!! The Embroidery Stitch Bible by Betty Barnden: Oh my gosh, I LOVE this book! All the stitches all in one place. So many ideas floating round in my head for my next project...Given to me by a fellow French Knot lover! So there you have it. My 'Ready to Read Pile'. Or maybe I should re-brand that as the 'Part-read Pile'! Hee hee!